We’d love your help. Let us know what’s wrong with this preview of Beg For Mercy by Keith Nixon. Two men fight to prove their innocence. A cop and a convicted murderer. One of them is lying. Fifteen years ago, local crime boss Duncan Usher was sent to prison for killing his wife. A young Detective Solomon Gray was first at the scene and instrumental in putting Usher away. But now Usher is out, released on a technicality. Usher has held a grudge all this time, and he won Two men fight to prove their innocence. A cop and a convicted murderer. One of them is lying. Usher has held a grudge all this time, and he won't stop until he gets revenge on the dirty cop who framed him all those years ago. Usher wants Gray’s help, acting as an inside man within the police. Gray refuses, but Usher has leverage – information on Gray's missing son. Gray agrees to work with Usher because he’ll do anything to find his son. But Gray is taking a huge risk; playing both sides of the game and carrying out his own investigation into what really happened fifteen years ago. Can Gray get to the truth? Or will the past bring Gray down? Set in the once grand town of Margate in the south of England, the now broken and depressed seaside resort becomes its own character in this dark detective thriller, perfect for fans of Ian Rankin, Stuart MacBride, and Peter James. Beg For Mercy is the third book in the series featuring Detective Sergeant Solomon Gray. Buy it now to discover whether Gray can track down the real killer and escape Usher’s clutches in this tense crime series. "Nixon combines his trademark gritty humour with a flawless police procedural." "A compelling murder mystery with a multilayered and engaging new hero. Great read." "A dark, uncompromising tale of loss, murder, and revenge. Glorious noir, which takes the police procedural elements and gives them new life. I can't wait to read the next step in Solomon Gray's journey for answers ..."
"Be prepared for everything to resolve in dramatic fashion." "I follow a lot of Detective series but this is by far one of the best." "You’ve no idea how glad I am to be back in Gray’s world!" "The author has such an amazing talent for telling tales." "Hard to put down and gripping to the very end." "There has to be another installment soon!" "Wow, this series just gets better." "Another strong instalment in a thoroughly enjoyable series." "A fantastic read with brilliant characters." "A very entertaining and well executed thriller. " "... deeply emotional, a dark rollercoaster ride." "A damaged detective, haunted by a tragic past, a young son missing or dead, a man on a quest for redemption. Detective Sergeant Solomon Gray is a fine creation and Dig Two Graves an intriguing, nourish mystery. Keith Nixon is a sparkling crime fiction talent." To ask other readers questions about Beg For Mercy, please sign up. Fifteen years ago, the wife of a criminal was murdered. The man who killed her called another friend to help him clean up. One of them was a cop ... and they framed the woman's husband. DS Solomon Gray ... is not only a cop, but a man who's been searching for his missing son for many years. He is also undergoing treatment for cancer that he's kept to himself. The book takes the reader from 15 years ago, when Solomon Gray was first responder as a rookie, and looks at the original case. Then it bounces to the here and now .... with Gray seeing signs that he himself might be in the frame. Usher is free and looking not only for the murderer of his wife, but also the one person who framed him. He's waited a long time to serve up his own brand of justice ..or is it revenge? This is well written, and although not fast paced, there's plenty to keep your eyes glued to each and every page. Solomon is a solid character with lots of layers. Although third in this series, it can easily be read as a stand alone. However, as always, I highly recommend starting at the very beginning so as to catch all those nuggets of gold that make this is a most interesting read. Many thanks to the author / e-Books / Netgalley for the advanced digital copy of this crime fiction. Opinions expressed here are unbiased and entirely my own. I would like to thank Netgalley and Bastei Entertainment for an advance copy of Beg for Mercy, the third novel to feature DS Solomon Gray of Margate police. Fifteen years ago Sol was a very junior DC but as first responder to the murder of Valerie Usher he became one of the team that arrested and convicted her husband, Duncan, a local crime boss. Now Duncan has been released and the Independent Police Complaints Commission is re-examining the original investigation. 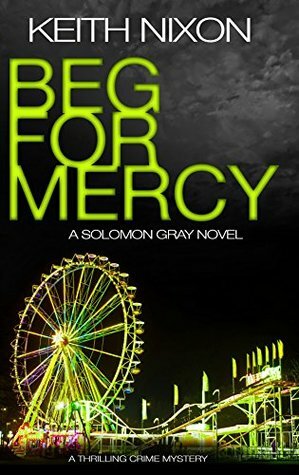 Sol has more to worry about bu I would like to thank Netgalley and Bastei Entertainment for an advance copy of Beg for Mercy, the third novel to feature DS Solomon Gray of Margate police. Fifteen years ago Sol was a very junior DC but as first responder to the murder of Valerie Usher he became one of the team that arrested and convicted her husband, Duncan, a local crime boss. Now Duncan has been released and the Independent Police Complaints Commission is re-examining the original investigation. Sol has more to worry about but he's in the sights of both the IPCC and Duncan Usher who seems to know more about Sol's son Tom's disappearance than he should. I thoroughly enjoyed Beg for Mercy which has a fascinating plot and a very readable style. I really like Mr Nixon's way with words which is crisp and economical and yet gets the point across in a way that the reader can visualise. The novel is told from Sol's point of view but with a dual timeline helpfully labelled "then" and "now". Normally I prefer a continuous timeline but the split works extremely well as both investigations had me hooked from start to finish. To be honest I don't think that the novel could have worked in any other way. Sol's current day investigation of what happened fifteen years ago matches the slow unfurling of what did happen. Both investigations have unexpected twists and a gradual revelation of the truth. With the "then" revelations slightly outpacing the "now" the reader is ahead of Sol but rather than making Sol's investigation seem redundant it adds a certain piquancy to his discoveries. Running in the background is Sol's hunt for his missing son. It doesn't have a major role to play but it informs many of his decisions and ends the novel in a shocking cliffhanger. You’ve no idea how glad I am to be back in the world of Solomon Gray! If you’ve not read the first two books in the series you should! So we are back with Sol and this has to be one of the best openings to a book I’ve ever read. Sure Sol is flawed but surely he’s not capable of murder or corruption! As with previous tales we change perspectives and time periods throughout the book jumping from the past to the present. This style of writing really makes it an interesting read and builds the suspense You’ve no idea how glad I am to be back in the world of Solomon Gray! As with previous tales we change perspectives and time periods throughout the book jumping from the past to the present. This style of writing really makes it an interesting read and builds the suspense up as the author reveals little by little the truth behind the case until all becomes clear. This case has links to Sol's past and his son Tim who was kidnapped many years ago and it appears a so-called friend might not be who Sol thought they were. But how does Duncan Usher fit in and what lengths will Grey go to in order to find out the truth. There’s a few twists in this one that you don’t see coming and you can see relationships are starting to wear down. Gray doesn’t have many friends left to rely on. Who will he call in his time of need? Beg For Mercy has to be the best in the series so far, which goes from strength to strength and the development of story just has me gagging for more. Will we ever know truth about what happened to Tom and is he alive? Oh I do hope the author lets us know one day but I’m happy to live with the suspense killing me if we get tales like this. This is a suspenseful, thought-provoking crime thriller. I could give you the normal words I like to use like dark and gritty but the only way I can describe the book honestly is exciting! I just want to keep going!! More more more! The book has that WOW moment for me when things start to fit together and left me with that tingling feeling a great book does when you replay the events in your head to imagine what it must feel like. Solomon Gray #3 is without doubt, the best so far in this series, an easy 5 stars. 15 years ago mobster Duncan Usher was sent to prison for life for murdering his wife and brand new detective Solomon Gray was integral in the case. However, Usher did not kill his wife.....he was framed for it. Fast forward 15 years and Usher is released on a technicality and badly wants revenge on those who have stolen 15 years of his life, especially the cops from back then, including Gray. Ah yes, Solomon Gray.. Solomon Gray #3 is without doubt, the best so far in this series, an easy 5 stars. 15 years ago mobster Duncan Usher was sent to prison for life for murdering his wife and brand new detective Solomon Gray was integral in the case. However, Usher did not kill his wife.....he was framed for it. Fast forward 15 years and Usher is released on a technicality and badly wants revenge on those who have stolen 15 years of his life, especially the cops from back then, including Gray. Ah yes, Solomon Gray......still searching for his missing son, trying to reconnect with his estranged daughter and now battling major health issues of his own is an engrossing, compassionate character that drives this series. This was my first venture into books by this author, and I wasn’t disappointed. Neither Fast nor slow paced, But enjoyable from first to last page! I thoroughly enjoyed the alternative way of telling this tale. Seeing the story both from the past and present simultaneously was a lovely change, and gave the story an entirely new angle! Reading from the characters first encounter with the Crime, and 15 years later when everything is under consideration because the man sent down was innocent (of Wow! Reading from the characters first encounter with the Crime, and 15 years later when everything is under consideration because the man sent down was innocent (of that at least), we see a whole new perspective within Crime stories. I Sincerely hope Keith has / is doing more in this style as it’s become a favourite Crime story for this! I enjoyed seeing the differences in the characters then and now, and the changes were well done and believable. fifteen years can make a lot of difference to people and their situations, and the Author has used this opportunity Beautifully! Really enjoyed this book, so easy to read and follow, the chapters actually told you if it was past or present so it was less confusing, this made the book more enjoyable to read and follow the story for me. The story was about a husband who was jailed for his wife's murder which he did not commit and after 15 years in jail, he was released and an inquiry was started surrounding the 3 officers involved in the case. As the case unravelled, it smelt of a set-up but who set him up? It was intriguin Really enjoyed this book, so easy to read and follow, the chapters actually told you if it was past or present so it was less confusing, this made the book more enjoyable to read and follow the story for me. Solomon “Sol” Grey was the first responder at the murder of Valerie Usher, ex wife of local gangster Duncan Usher. It seems like an open and shut case. Duncan, spurned by his ex wife, kills her and frames local lad Craig Munby for the murder. But Grey supports his superiors to put Duncan away. Fifteen years later, due to an apparent miscarriage of justice Duncan Usher is back on the street and wants to set the record straight. Flashing back and forth between then and now tells a story of corruption and loss. This story keeps you guessing until the last page. Loved this book and love the series. What a cliffhanger to finish on. Cannot wait for the next book to see where Sol’s journey searching for his son takes him. My favourite Solomon Gray novel so far. I really liked the hopeful feeling (at least to me), despite Gray's cancer, things are starting to make sense about the past and how events have affected present relationships and realities. The first Soloman Gray novel I’ve read! Absolutely loved it, wish I’d read the other two first tbh, I’ll be reading them in the near future! This is book three in the Solomon Gray series, I hadn’t read the first two, and am happy to say that the book does read well as a stand-alone, but if you have read the previous books, you will have a better understanding of the issues Grey lives with. For example, the disappearance of his son, Tom ten years ago, which still haunts him, as he holds himself accountable for Tom's disappearance. The repercussions: the decline of his marriage, the death of his wife and his ongoing separation from his This is book three in the Solomon Gray series, I hadn’t read the first two, and am happy to say that the book does read well as a stand-alone, but if you have read the previous books, you will have a better understanding of the issues Grey lives with. For example, the disappearance of his son, Tom ten years ago, which still haunts him, as he holds himself accountable for Tom's disappearance. The repercussions: the decline of his marriage, the death of his wife and his ongoing separation from his surviving daughter, Hope - are all matters of ongoing regret, and his sorrows echo throughout the book. From the beginning, what is clear is that Gray is a dedicated detective, who is very good at his job. I enjoyed the dynamics of the police team, particularly his relationship with his line manager, Yvonne. I felt that all the characters were well-rounded and believable, even though they are not all likable! The storyline moves at a good pace as the plot twists and turns. I read this book in a couple of sessions, and I'm really pleased there are two more for me to read, albeit in the wrong order! Another fanatstic 5 star read. This is third installment featuring Solomon Gray and it didn't disappoint. I follow a lot of Detective series but this is by far one of the best. The author makes you feel like you really know the characters. With this installment I loved the then and now storyline which allowed us to see how the characters have developed over the years. The storyline had me guessing all the way through. Once I thought I had figured it out there comes another spanner in the works! Sh Another fanatstic 5 star read. The storyline had me guessing all the way through. Once I thought I had figured it out there comes another spanner in the works! Shocks galore. Although it was case closed and Sol finally got to start building bridges with his daughter there were still so many questions unanswered. Will Mike be ok? Will Yvon still be in charge? What will happen with this new found 'friendship' with Sol and Usher? Oh and where the hell is TOM???? Counting the days for number 4! Great read, bring on the next installment. I’ve read and enjoyed the first two instalments of the Solomon Gray series and am glad but not surprised that the latest instalment keeps the standard high. Though the book works well as a stand-alone, to get the most from it I’d recommend starting with book one. Each book reveals a bit more of Grays past, the murky activities of colleagues and associates, and the back story of Gray’s missing son. Beg for Mercy is a gritty tale of British gangland intrigue. Beginning with a murder, the plot twist I’ve read and enjoyed the first two instalments of the Solomon Gray series and am glad but not surprised that the latest instalment keeps the standard high. Though the book works well as a stand-alone, to get the most from it I’d recommend starting with book one. Each book reveals a bit more of Grays past, the murky activities of colleagues and associates, and the back story of Gray’s missing son. Beg for Mercy is a gritty tale of British gangland intrigue. Beginning with a murder, the plot twists throughout, holding its secrets till the end as the narrative shifts between past and present, which works really well to drop in surprises and increase tension. As always there’s a plausibility and thoroughness to Nixon’s characters and plotlines with great attention to detail. A very entertaining and well executed thriller. Highly recommended. I thoroughly enjoyed this book, and it was a bonus to discover that it's set relatively locally to me, so while I didn't know the locations well, I could still picture them a little - although the constant referral to Thanet as an island was slightly misleading, as it's been a very long time since it was actually separated from the mainland. The story develops skilfully along two timelines, the present as Usher is released from prison and seeks justice, and the past as we follow the original inve I thoroughly enjoyed this book, and it was a bonus to discover that it's set relatively locally to me, so while I didn't know the locations well, I could still picture them a little - although the constant referral to Thanet as an island was slightly misleading, as it's been a very long time since it was actually separated from the mainland. The story develops skilfully along two timelines, the present as Usher is released from prison and seeks justice, and the past as we follow the original investigation. Although the book is third in a series, there was plenty there for a new reader like me, but also enough to make me interested in getting the earlier books to read about the earlier aspects of Gray's story. One big reason for dropping a star, though, was the naming. Two main characters, both part of the police force, are called Copeland and Carslake. Those names are far too similar to a quick reader, leading me to spend far too much of my time trying to remember which was which. There were one or two other bugbears, but this was by far the most intrusive. Generally, though, the story flowed well, the characters were interesting and the plot held my attention throughout. A gripping page turner of a novel. I was new to this series but it didn't mar my enjoyment at all. Well paced and well told and even though it seems the bad guy becomes clear quite early there are unexpected outcomes and turns in the story. I liked the characterisation and the depiction of the underlying emotions. I will now be going back to the books I've not read yet. I have re-read this as part of the reading the whole series as the next book has just been released. I rea A gripping page turner of a novel. I was new to this series but it didn't mar my enjoyment at all. Well paced and well told and even though it seems the bad guy becomes clear quite early there are unexpected outcomes and turns in the story. I liked the characterisation and the depiction of the underlying emotions. I will now be going back to the books I've not read yet. Blasted through this in two sittings! Compelling page turner. I really enjoyed Beg For Mercy by Keith Nixon. This was a really good read and characters were really developed. The ‘now and then’ structure worked great in this book. Good mystery with lots of twists. I did not realize it was a series book! Surprise ending!! Can’t wait for more! Thank you NetGalley for the opportunity to give an honest review for the ARC. A really good read. Feels like the strands of the investigation into Gray's son's disappearance are coming together. The best so far, Gray continues to develop really nicely. Looking forward to seeing how it concludes. This series just keeps getting better. If you’ve read the two prior books in this series you’ll be familiar with not only Solomon Gray, the series protagonist, but also his coworkers in the local police department, plus Frank McGavin, the local crime boss. While he got a brief mention previously, it wasn’t obvious that McGavin essentially took over for Duncan Usher, who was convicted of murder in Solomon’s first big case. When Usher is unexpectedly released from prison due to a technicality, it kicks off an investigation of the origi If you’ve read the two prior books in this series you’ll be familiar with not only Solomon Gray, the series protagonist, but also his coworkers in the local police department, plus Frank McGavin, the local crime boss. While he got a brief mention previously, it wasn’t obvious that McGavin essentially took over for Duncan Usher, who was convicted of murder in Solomon’s first big case. When Usher is unexpectedly released from prison due to a technicality, it kicks off an investigation of the original investigation and those involved in in. The story switches back and forth with scenes from “Then” (15 years ago when Gray was on the team investigating the murder of Usher’s wife) and “Now,” as Gray tries to piece together what happened and what went wrong back “Then.” The mystery and Gray’s investigation are what you’d hope for and expect in a good thriller such as this. I also found it interesting in that knowing some of the characters from previous books, then contrasting their interactions in the first investigation (back ”then”) to how things are “now,” gives a different and more complete feel for how they’ve evolved over time, not only as policemen, but as coworkers. Last, all through this series has been the specter of Tom, Solomon Gray’s missing son, hanging over every investigation. Gray is always looking for clues, digging behind the scenes where he can, convinced that Tom is alive somewhere and that he’s going to find the person with the answer if he keeps looking. I’ve wondered whether there was anything to find, thinking Tom’s body had probably been swimming with the fishes of buried in a grave that was never going to be discovered. But Gray appears to make enough progress on this quest in this book that I’m not nearly as pessimistic. Maybe the next book will be the one to finally find out what happened to Tom. If you like darkish crime fiction, especially with a little British flavor (make that flavour), this series including this latest installment is a good fit. This the third book in a series about Solomon Gray. Although I have read the first two books (check out my reviews of Dig Two Graves and Burn the Evidence), this also works just fine as a standalone. In my opinion this is the strongest so far, and I loved the other two! The story is set in dual timelines - fifteen years ago when Duncan Usher was accused of this wife's murder, and present day, where he has been released from prison. I really enjoyed this approach - seeing the story develop like t This the third book in a series about Solomon Gray. Although I have read the first two books (check out my reviews of Dig Two Graves and Burn the Evidence), this also works just fine as a standalone. In my opinion this is the strongest so far, and I loved the other two! The story is set in dual timelines - fifteen years ago when Duncan Usher was accused of this wife's murder, and present day, where he has been released from prison. I really enjoyed this approach - seeing the story develop like this. It was great to learn about the younger Sol, when his family was complete, he was an enthusiastic young cop and in awe of his mentor Jeff Carslake. And then to see him now, a pretty haunted man, certainly more jaded and who perhaps now thinks differently about Carslake. As Sol begins to investigate, the case gets murkier and murkier. Is there really something going on within the police? Can Gray solve the mystery in time? I can't answer these questions for you without giving away spoilers, so I suggest you read the book instead! Wow! I've really enjoyed the "then and now" transitions in this book. A fifteen year old case is reopened and the man convicted has been allowed to walk out of prison. Being one of Gray's first cases, he has to peel the layers back to find out what actually happened fifteen years ago. A gripping read, I'm throughly enjoying this series and find myself thinking of gray and the storylines when I'm busy doing other things. I look forward to sitting down with a coffee and continuing from where I left Wow! I've really enjoyed the "then and now" transitions in this book. A fifteen year old case is reopened and the man convicted has been allowed to walk out of prison. Being one of Gray's first cases, he has to peel the layers back to find out what actually happened fifteen years ago. When Valerie Usher is found murdered on her own bed with Craig Mundby also in the room with wrists slit at first glance it appears to be a murder suicide? Recently promoted Detective Soloman Gray is first on the scene his biggest case yet. The notorious Duncan Usher Valerie’s estranged husband is charged and convicted of the murder and attempted murder although he always protested his innocence. Solomon is new to the CID team and he has his doubts that Usher is guilty. Fifteen years on Duncan Ushe When Valerie Usher is found murdered on her own bed with Craig Mundby also in the room with wrists slit at first glance it appears to be a murder suicide? Recently promoted Detective Soloman Gray is first on the scene his biggest case yet. Fifteen years on Duncan Usher is released on a technicality his first stop is to see Solomon Gray he will stop at nothing to find out who set him up. I love Keith Nixon books and this did not disappoint. Solomon Gray is still seeking answers as to his son's disappearance. The book jumps between the past and the present as the suspense builds throughout the book. This can be read as a stand alone but best to start with book one in the series. Do yourself a favour and read them now. if you like Line of Duty, you will love this author. Thanks to Net Galley for my copy. Sign up to a regular newsletter for information on upcoming books, offers etc. at http://www Keith Nixon is a British born writer of crime and historical fiction novels. Originally he trained as a chemist, but Keith is now in a senior sales role for a high-tech business. He can be found on Twitter (@knntom) and Facebook or his website www.keithnixon.co.uk.